Da Nang — The central city of Da Nang should develop as a unique smart city and a competitive global center of tourism and services, Prime Minister Nguyen Xuan Phuc said at a meeting to mark the 20th anniversary of Da Nang’s autonomous status directly under the central government. He applauded the achievements of the past 20 years in terms of international integration and reform, the attraction of a high quality labour force, and the city’s development as a draw for business start-ups and as a driving force of economic growth in the central region. “Da Nang will serve as magnet for foreign direct investment, information technology and skilled labour force. It should be a front-runner in business reform, education and business start-ups,” he said, adding that the city should develop 45,000 enterprises by 2020. The PM also said Da Nang, situated in central Vietnam, has to build links with other locales in the region and serve as a core of the central region’s socio-economic development. He suggested the city focus on the quality of its business environment in order to be competitive with other urban centers in the world. Phuc noted that 2017 will present the city of one million people with a great opportunity, as well as a challenge, when it hosts the Asia-Pacific Economic Cooperation (APEC) Summit later this year and other APEC events. 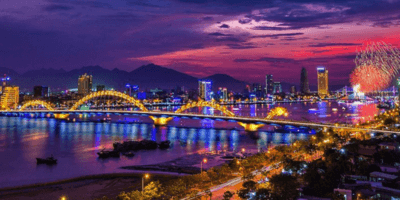 The city’s party secretary, Nguyen Xuan Anh, said Da Nang had turned from a third-class urban locale into a first-class city under the central government between 1997 and 2017. He said the city earned total revenues of VND 54 trillion (US$2.4 billion), contributing VND19 trillion ($840 million) to the State budget in 2016. “The city has seen a rapid development in tourism and services, from 61 hotels with more than 2,000 rooms in 1997 to 585 hotels with 21,000 rooms after 20 years,” Anh said. “Da Nang is now four times larger than in 1997, with a total area of 21,300ha." Anh, who is also chairman of the city’s People’s Council, said the city had been ranked on top of the Provincial Competitiveness Index (CPI) every year since 2010, and was a leader in administrative reform and information technology. He said the city’s downtown, which was in the past connected with its beach destinations on Son Tra peninsula by two downgraded bridges, is now accessible through nine modern, attractively designed bridges. In 2012, it was selected for a Low-Carbon Model Town Project at the 44th APEC energy meeting in Washington DC. The city had been developing low-carbon model projects, including battery powered bicycles, technologies to curb greenhouse gas emissions and renewable energy sources, a metro system and Rapid Bus Transit (BRT). The city had already cut 12,000 tonnes of carbon emissions during a pilot project between 2008-11. The city hosted 5.6 million tourists, 1.65 million of them foreigners. — From Vietnam News. Read more here. Da Nang will be sharing on their goal of becoming the first smart city in Vietnam at Asia IoT Business Platform Singapore, 14 February 2017. Early bird delegate rates are available until this Friday, 13 Jan.